It was almost ten years ago that then-Deputy Spokesperson, Torsten Akesson, asked Pippa Wells to become editor of the new 'ATLAS e-Newsletter'. Over the last ten years, the publication has accompanied ATLAS through construction, testing, puzzles, surprises, excitement, and finally physics. The magazine itself has morphed and changed along with the focus of the collaboration and now, as the e-News readies itself for its latest phase change, we take a little look back at what has gone before. 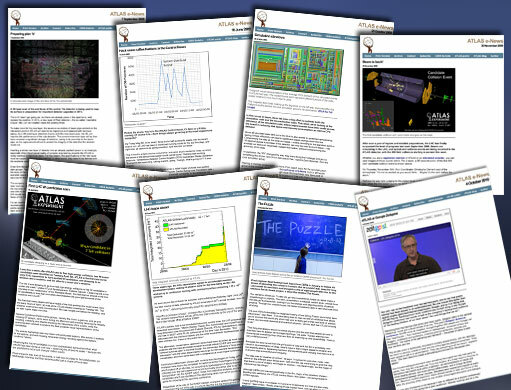 ATLAS e-News began life as a quarterly publication intended to help collaborators near and far alike keep up with the latest developments, designs, and discussions from their experiment. Lively and informal, it aimed to distil all that was going on into a neat little snapshot. Articles in the early issues were mainly focussed on executive summaries from workshops and overview weeks, but also included progress reports on the manufacture, testing, and transport of various detector parts, test beams and other preparations for physics running. The ATLAS cavern handover and the first cosmics seen through both the silicon detectors simultaneously were particular highlights. After three years as Editor, Pippa passed the baton to Jo Pater, who in turn eventually handed over to Pauline Gagnon, in May 2006. The essential format of e-News remained the same, but Pauline began to push for more people-focussed articles, aiming to give absent collaborators more of a feel for the fun things happening on-site at CERN and help people to make connections with one another. By mid-2007, eye-popping photographs from Claudia Marcelloni – the sort we've now all become accustomed to – started to decorate the pages too. By 2007, so much news-worthy stuff was happening on the experiment, that Pauline decided to try to produce one issue per month. Towards the end of the year, and with the LHC looking set to start at any time, three science journalists from London – Colin Barass, Cristina Jimenez, and Ceri Perkins – were brought on board to help. This marked a big change for e-News; rather than having to write the content themselves, collaborators could be interviewed alongside others offering different perspectives in the same article, or receive help and guidance on feature writing. The idea was to make the publication more relevant, more dynamic, and less of a jargon jungle. The journalists hit the ground running and within three weeks of arriving in Geneva, they had re-designed and re-launched the single-page e-News into a website interface, allowing readers to see content from the whole magazine on one front page, and pick and choose which articles were interesting to them, including a new 'Profiles' section. Having dedicated writers on board also meant that every exciting moment of the final construction and preparations for the LHC start-up could be covered, and in the year that followed, more issues were released (38) than had been in total since the e-News began (31). There was a regular News from the Pit update, more coverage of outreach events like the 2008 Open Day, and we waited with baited breath as the cavern was sealed and first beams arrived with much fanfare. In May 2008, Colin handed over his job to US-born Katie McAlpine in order that she get to stay working in Europe… a smart move, it turned out, as she later agreed to marry him. In the aftermath of the LHC 'incident', as activity and excitement died down and stories became more software-focussed, e-News was slimmed down to a 1.5-writer operation and a bi-weekly publishing schedule. Katie moved to London and contributed her unique blend of pushing political boundaries, expert LHC commentary, and tongue-in-cheek physics rap, from a distance. Word. In April 2010, following two years with e-News, Katie left for a six-month internship with New Scientist and was replaced by upbeat writer and webmaster Birgit Ewert, whose favourite assignment is writing profiles. 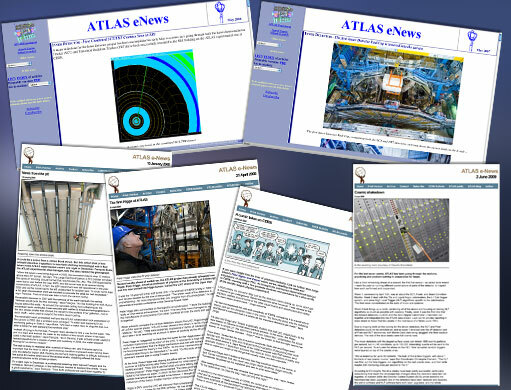 ATLAS finally saw its first collisions at the end of 2009 and, after bearing witness to the excitement in the Control Room that day, e-News has been there at every step of the way: from the first journal paper to be submitted, through the first W-boson candidate sightings, via the world's best limits on the hypothetical q* particle, to the hunt for new states of matter. The physics adventure has begun. With Ceri Perkins moving on after over three years writing for the collaboration, it's time for e-News to contemplate where its own journey will lead next. If you would like to contribute comments or suggestions about how it should evolve to best meet your needs, please forward them to Birgit Ewert atlas-e-news@cern.ch.